Whenever I go to look at the fresh fish at my local market, everything is so fresh and glistening that I just want to buy it all. This week I limited myself to some small and tender squid and the last of the crabs. The crabs that we get here are small but very tasty, so will make a fantastic soup. The squid was quickly fried with garlic and chilli for lunch. This is so simple it is almost not a recipe. 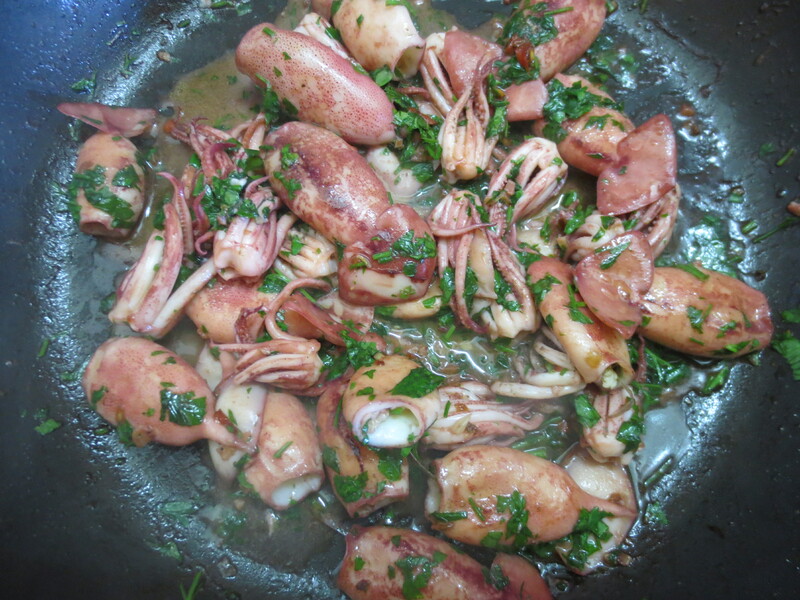 The cleaning of the squid is the most time consuming job in preparing this dish. Cut the tentacles off just above the squid’s eyes, and then remove the sharp beak type mouth in the centre of the tentacles. 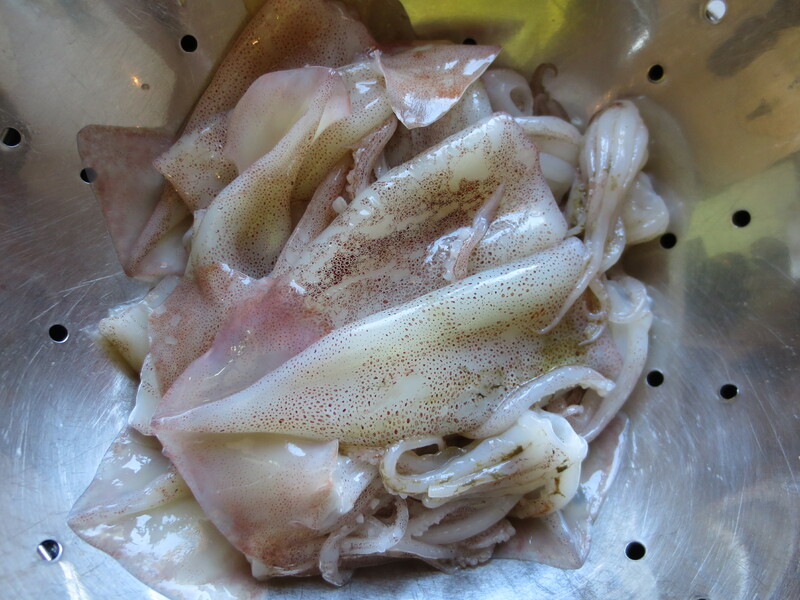 Pull the innards out of the squid and discard. A cat will love you if you send these their way. Put the empty bodies and tentacles into a colander and wash thoroughly. Leave to drain while you chop the garlic, chilli and parsley. Heat the oil in a shallow pan and add the garlic and chilli. Fry for a couple of minutes. Add the squid and keep frying on a medium heat, turning from time to time. 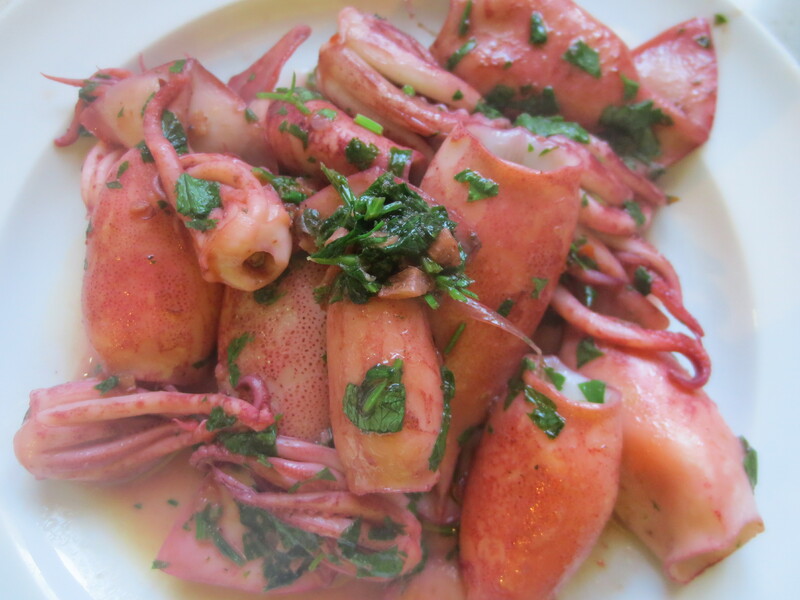 The squid are cooked once they are opaque and a bit pink, which should take about 7 minutes. Add the parsley and lemon juice. Stir to blend and to moisten the tasty bits at the bottom of the pan. Serve with a simple tomato salad and some fresh bread.